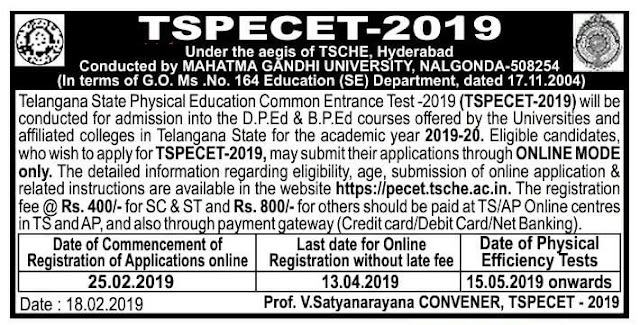 A Common Entrance Test designated as Telangana State Physical Education Common Entrance Test (TSPECET - 2019) will be conducted by Mahatma Gandhi University for the academic year 2019-2019 for seeking Admission into B.P.Ed. (2 Years) and D.P.Ed. (2 Years) Courses. The Application form is for Common Entrance Test for the entry into the Physical Education courses. 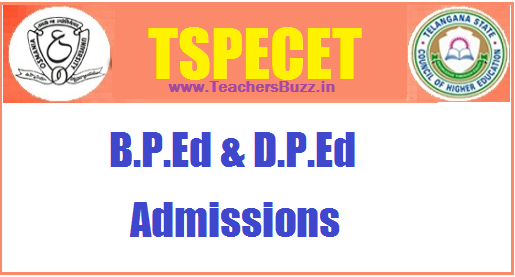 TS PECET 2019 Notification, Exam dates, Fee, Eligibility Telangana PECET 2019 Exam date, Notification, TS B.P.Ed D.P.Ed Online Application form, Important dates, Eligibility, How to Apply, Last date for Apply online, Test center, TS PECET Hall Ticket Results and other details for B.P.Ed, U.G.D.P.Ed courses available @ pecet.tsche.ac.in. Bachelor of Physical Education will be a two(2) year course. Physical Education Department Officials will invite the Online Applications from the eligible candidates for Admission into two years B.P.Ed and two years UG D.P.Ed Courses offered by the universities and affiliated colleges in the Telangana State for this academic year 2019-2020. TS PECET official website tspecet.org, pecet.tsche.ac.in. (TSPECET-2019) will be conducted for admission into the B.P.Ed & D.P.Ed courses offered by the Universities and affiliated colleges in Telangana State for the academic year 2019-19. Eligible candidates, who wish to apply for TSPECET-2019, may submit their applications through ONLINE MODE only. The detailed information regarding eligibility, age, submission of online application & related instructions etc are available in http://pecet.tsche.ac.in. The Application Registration Fee @ Rs. 400/- for SC & ST and Rs. 800/- for others should be paid at TSOnline centers and through credit/debit and net banking in Telangana State. Candidates satisfying the following requirements shall be eligible to appear for PECET-2019. 2. Candidates should belong to the both states of Telangana and Andhra Pradesh. The candidates should satisfy local / non-local status requirements as laid down in the Andhra Pradesh Educational Institutions (Regulation of Admission) order, 1974 as subsequently amended. Candidates should have appeared third year degree final examination or passed three years degree recognized by any university in TS and AP or any other university recognized as equivalent there to and should have completed 19 years of age on 01.07.2019. However, the candidate has to submit the pass certificate at the time of counseling. Candidates should have appeared or passed Intermediate or equivalent course recognized by the Government of Andhra Pradesh or Telangana State and should have completed 16 years of age on 01.07.2017. However, the candidate has to submit the pass certificate at the time of counseling. To write skill test, he or she must have the knowledge of any one of the game as mentioned below. A candidate has to choose one game while registering for Telangana PECET 2019. The skill test comprises of 100 marks. The Physical Education common entrance test for entry of students into B.P.Ed (two years) and U.G.D.P.Ed (Two years) courses comprise of two parts, namely a) Physical Efficiency Test and b) Skill Test in Game. Qualifying cutoff mark in the entrance test is 30% (150 marks out of total 500 marks). However for candidate belonging to SC / ST no qualifying percentage marks is prescribed. 6. Click on submit and Save it.